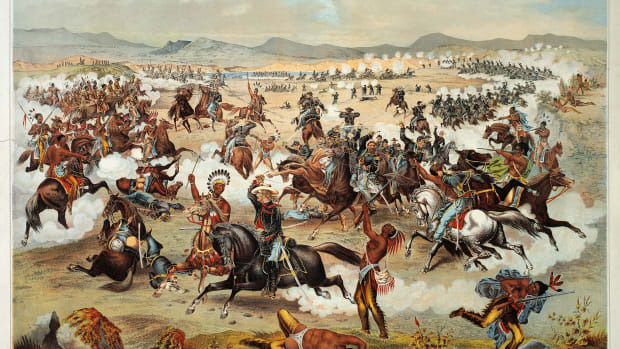 As a young member of the Oglala Lakota (Sioux) tribe in 1876, Black Elk witnessed the Battle of Little Bighorn, in which Sioux forces led by Chiefs Sitting Bull and Crazy Horse dealt a crushing defeat to a battalion of U.S. soldiers led by Lieutenant Colonel George A. Custer. In the 1880s, Black Elk toured with Buffalo Bill’s Wild West Show before returning to the Pine Ridge Reservation established for the Oglala in South Dakota. After the massacre of more than 200 Sioux at Wounded Knee Creek in late 1890 effectively put an end to Native American military resistance in the West, Black Elk remained at Pine Ridge, where he later converted to Christianity. In 1930, he began telling his story to the writer John Neihardt; the result was “Black Elk Speaks” (1932), a vivid and affecting chronicle of Lakota history and spiritual traditions. Black Elk was born in 1863 on the Little Powder River, in what is now Wyoming. Like his father before him, Black Elk would become a warrior, as well as a medicine man or priest of the Oglala Lakota (Sioux) tribe. Both of them would follow Chief Crazy Horse, a second cousin of Black Elk’s, who as early as 1865 acted as a leader of Sioux resistance to white settlement in the northern Great Plains region. In 1874, after gold was discovered in the Black Hills of the Dakota Territory–long revered by the Sioux as Paha Sapa, a sacred land–prospectors flooded the region, ignoring earlier treaties made with the Native Americans. The Sioux resisted a government ultimatum to sell the Black Hills territory and forces led by General George Crook marched into the region in the spring of 1876. Did you know? By the time he met John Neihardt in 1930, Nicholas Black Elk was nearly blind. He was also illiterate, and spoke no English. He and Neihardt communicated through an interpreter. In mid-June, Crazy Horse and his followers (including the young Black Elk), surprised Crook’s men in the Rosebud River Valley and forced their withdrawal before heading north to join the main Sioux encampment led by Sitting Bull on the banks of the Little Bighorn River. 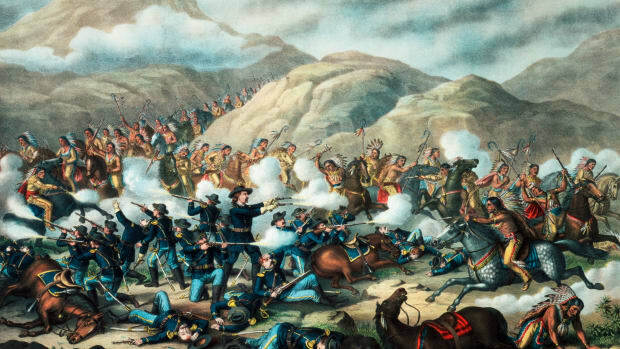 It was there on June 25 that the Sioux soundly defeated a U.S. battalion led by Lieutenant Colonel George A. Custer, whom the Sioux called “Long Hair.” In the wake of this historic battle, the Sioux came under even more military pressure from U.S. forces; they also grew increasingly short on food, due to the diminishing number of buffalo in the region. In May 1877, Crazy Horse was induced to surrender to General Crook with promises of a reservation for his people. 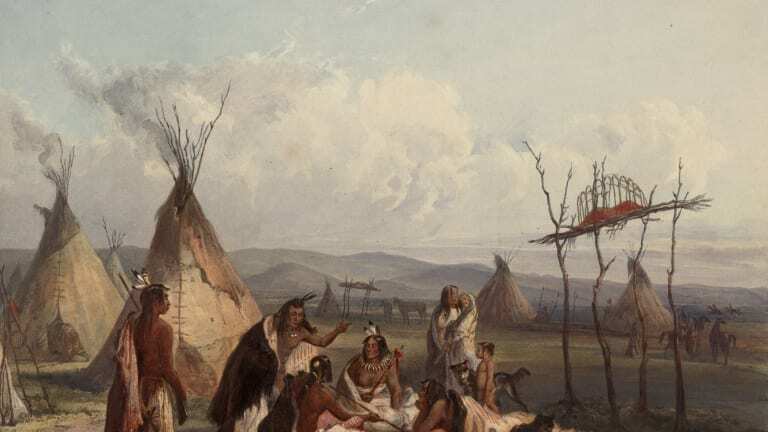 On May 6, however, the great chief was killed during a struggle with soldiers who were seeking to lock him into a guardhouse at Fort Robinson in Nebraska. 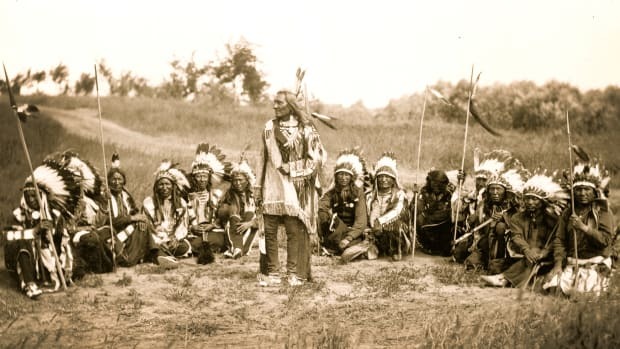 Rather than be forced onto reservations, Black Elk and other Sioux headed north in the fall of 1877 to Canada–or “Grandmother’s Land”–where Sitting Bull had decided to make a home for his followers the previous spring. 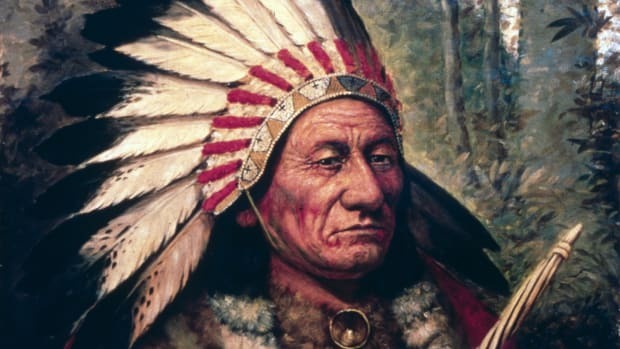 Despite efforts to force the chief’s return, Sitting Bull remained in Canada for four years, long after many other Sioux, including Black Elk, had returned to the United States. In late 1881, Black Elk moved to the new Pine Ridge Reservation, which was being established for the Oglala in the southwestern Dakota Territory; he eventually settled near Wounded Knee Creek and from the age of 19 became known as a healer within his tribe. In 1886, Black Elk left the reservation to tour with Buffalo Bill’s Wild West Show, and would perform in cities ranging from Omaha and Chicago to New York and Manchester, England. After returning to Pine Ridge Reservation in 1889, he became involved with the Ghost Dance movement, which held that spiritual rituals such as dance and song would cause the white men to leave, the buffalo to return and the Native American way of life to be reestablished. This movement swept across the Great Plains, reaching the Sioux at Pine Ridge by early 1890. 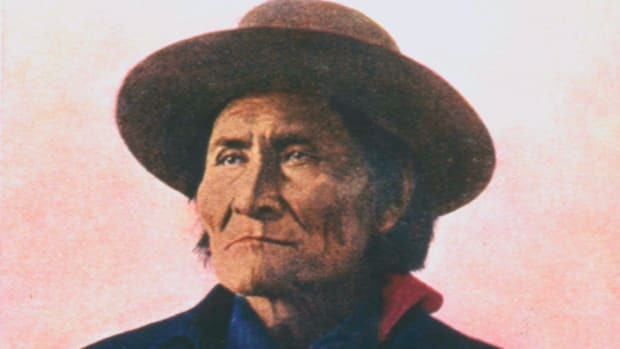 Concerned about the Ghost Dance movement’s growing strength, U.S. government officials arrested some of its leaders, including Sitting Bull, who was killed in mid-December 1890 in the process of being captured. 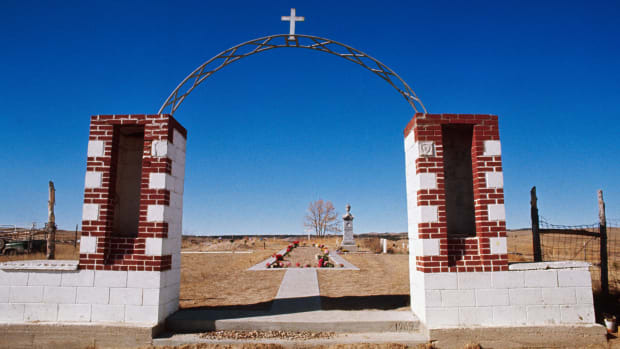 Two weeks later, the U.S. 7th Cavalry division surrounded and attacked a Sioux encampment at Wounded Knee Creek, brutally killing more than 200 men, women, children and elders. 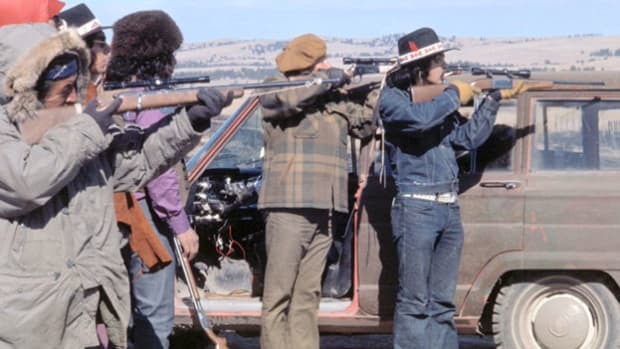 The Battle of Wounded Knee effectively marked the end of Native American military resistance in the West, as well as the decline of the Ghost Dance movement. After being wounded in an attempt to retaliate after Wounded Knee, Black Elk was convinced to surrender by another Sioux chief, Red Cloud. He remained living on the Pine Ridge Reservation and later converted to Catholicism, taking the name Nicholas Black Elk. In 1930, the writer John Neihardt (whose earlier work had dealt with the Omaha tribe of Nebraska) met with Black Elk, by then a tribal elder, at Pine Ridge. Neihardt would record Black Elk’s life story, along with his extensive knowledge of Lakota history and traditions, in “Black Elk Speaks” (1932). Celebrated as a great spiritual text, the book became the bestselling work in history by a Native American.